Rosalie Evans Thompson age 98, of Myrtle Beach, SC and formerly of Whiteville, NC joined her Savior Tuesday December 4, 2018 at home surrounded by her loving family. 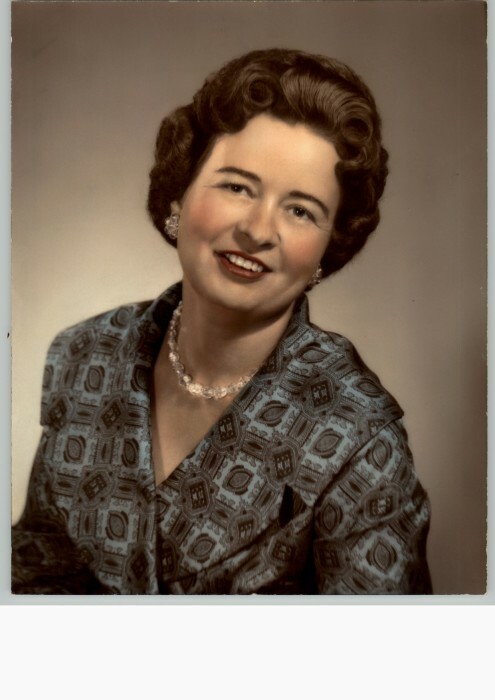 Mrs. Thompson was born March 14, 1920 in Brunswick County, a daughter of the late Ella Elizabeth Cox Evans. She was a member of Freeland Baptist Church where she was a choir member for many years. She was owner and bookkeeper for over 20 years with Thompson Abattoir later known as Thompson Packing Co. and owned and operated several motels in Myrtle Beach, SC. She felt like her greatest accomplishment was being a Mother, Grandmother, Great Grandmother and Great Great Grandmother! In addition to her mother, she was preceded in death by her husband, Grady Lee Thompson, a son, Lewis B. Thompson, 2 grandchildren, Jason G. Thompson and Amanda B. Thompson, 6 brothers and 3 sisters, a daughter–In-law Marie M. Thompson and a grandson-In-law Stuart Clark. Surviving are her sons Michael B. Thompson (Kathy) of Calabash, NC, G. Ben Thompson of Myrtle Beach, SC, daughter in law, Martha J. Thompson of Whiteville, NC, grandchildren; Gina T. Shelley (Ford), Gaither B. Thompson (Melanie), Kelly T. Clark, Lindsey A. Cribb (Josh) and Bentley L. Thompson. great grandchildren; Cagney S. Hart, S. Lawson Thompson, V. O’Ryley Shelley, E. Kinley Thompson, Taylor B. Thompson, Cameron J. Cribb, Christian D. Cribb, Josie A. Cribb and Carter L. Cribb and a great great grandchild K. O’Marah Hart.. The family will receive friend’s from 2 pm to 2:45 pm on Friday December 07.2018 at McKenzie Mortuary Chapel 112 Jefferson St. Whiteville, NC 28472 with the services following at 3pm with Dr. M.Wayne Brown officiating. Interment will follow in Columbus Memorial Park. The family would like to extend a heartfelt thank you to Americare of Myrtle Beach, S.C.